San Diego, CA-Reggae artist Papa San presents his latest record One Blood that will be distributed by Syntax Creative. The 12 time Marlin Award winner, World Music Award, Stellar Award winner, and Dove Award nominee joins Syntax's growing roster of clients who not only utilize the distribution platform, but also benefit from Syntax Creative's social strategy and graphic design services. With an official street date of January 21, 2014, One Blood will be Papa San's 25th studio album and his first collection of collaborations with artists from multiple genres. "We're looking forward to working with Papa San. He has such a rich legacy in both Gospel and Reggae Dancehall," says Syntax Creative CEO Tim Trudeau. "We're really excited about this project of his in particular, because so many great artists collaborated together to make one cohesive project." 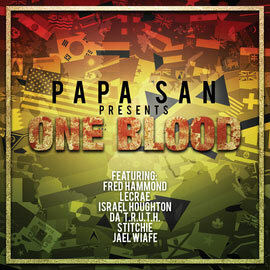 On One Blood, Papa San shares the mic with Grammy Award winners Lecrae, Fred Hammond, and Israel Houghton, among others. He also works with his son, Tyshane Thompson of production team 808&Elite, who produced most of the tracks. "My project is made up of many different artists from different backgrounds, collaborating with me towards one common goal, which is to spread the good news of Jesus Christ and to show the unity of believers across the world," says Papa San. One Blood's first single, "Step Up", features Da' T.R.U.T.H. and is being added to radio now. The album currently is available to pre-order at iTunes and will be available at other popular digital music providers in January 2014 when it releases. "Syntax can relate to today's generation by touching the lives of young people who are in the digital space looking for connection," Papa San says. "They were the best choice to get our music and message out." Trudeau adds, "It's a pleasure to work with a legend like Papa San. He opened the doors for so many other artists and continues to open doors for those who will come after him. We can't wait to get this album into the ears of his fans." Papa San has been a trailblazing artist in Reggae Dancehall, and Gospel music for nearly 30 years. The Dove Award nominee is also the winner of 12 Marlin Awards, in addition to his Stellar and World Music Awards. His albums and singles top the Billboard Reggae charts. He has been featured on such hit songs as Kirk Franklin's "Awesome God" and Toby Mac's "Whoopsie Daisy (Catchafire)." He has shared the stage with legendary artists Yellowman, Shabba Ranks, Lietenant Stitchie, Admiral Bailey, among others. He was most recently featured on the song "The Fever" from Lecrae's chart topping album 'Church Clothes 2'. His latest album, One Blood, releases January 2014, featuring production by Tyshane Thompson of 808&Elite and collaborations with Lecrae, Israel Houghton, Fred Hammond and others. Syntax Creative, based in San Diego, California, is one of the top independent digital distributors representing more than 100 record labels. Syntax handles many top independent artists such as Tamela Mann, Propaganda, Marvin Winans, Sho Baraka, John P. Kee, Flame, and Braille among others. Their clientele includes Central South, Answers In Genesis, Pinecastle Records, Crossroads Music, Humble Beast, among others. To learn more, visit: www.syntaxcreative.com.